The ATSC Terrestrial TV standard is based on an 8-VSB modulation with pilot insertion. The sequence of 8 level symbols with levels ±1, ±3, ±5 and ±7 is the input to the 8-VSB modulator. The symbol rate is 10.762 Msb/s. The modulator has to modulate these symbols using VSB modulation and form the VSB spectrum that fits within a terrestrial 6 MHz channel. To form this spectrum, the 8-VSB modulator has to process symbols by real and imaginary VSB filters and create a complex 8-VSB spectrum. 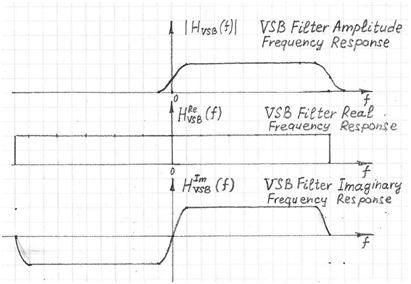 The real VSB filter is a bypass filter that is just a delay block. The pilot insertion happens by adding a constant value to the input filter. For ATSC the standard pilot value is 1.25. The rolloff of the spectrum and respectively of the imaginary filter has to be 0.115. After modulation to the intermediate frequency fIF the signal is then shifted to radio frequency (RF).